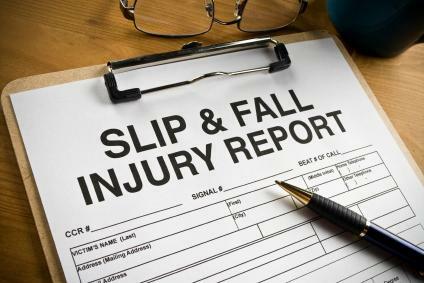 By recognizing slip and fall fraud indicators and reporting them to your insurance provider, you can help to fight this crime. Be alert for the following "red flags" when investigating your slip and fall incidents. But remember, no red flag by itself necessarily indicates fraud. A by-stander, witness, unidentified caller, or other informant offers "tips" that fraud was intended or gives information contrary to that of the claimant. Claimant has no legitimate purpose for being on the premises or in the area where the incident is alleged to have occurred. For example, the incident occurs in a seldom used stairway or in an area off limits to customers or visitors. Claimant is not a regular patron or is a recently hired employee. For example, the claimant is a transient, an out-of-towner, or an individual with only a P.O. Box or hotel address. Claim involves a recently terminated or otherwise disgruntled employee. Claimant is hostile, makes aggressive demands for quick settlement, or alleges excessive damages. Claimant immediately brings up the subject of "liability" or "insurance." Claimant is represented by an attorney before even reporting the incident. Immediate inspection of the scene reveals nothing unusual about the walking surface - no foreign or wet substance on the floor. Claimant's footwear and clothing show no signs of a fall or of contact with foreign substance or liquid. Claimant behaves in a manner to suggest alcohol intoxication, substance abuse, emotional instability, prior injury, or physical illness not related to a slip and fall. Claimant seeks additional medical care after no objective injury was found during emergency room treatment or in the first medical exam. Claimant does not return to work the next day after a minor injury or no objective injury. Claimant enters into chiropractic care in the absence of an objective diagnosis or after a minor injury. Claimant enters into psychiatric care, allegedly as a result of the incident. Tips are received or there is evidence that the allegedly "disabled" claimant is active or even working. Claimant is disgruntled, recently unemployed, or has reason for not wanting to return to work. Claimant refuses or is unable to provide reasonable documentation of lost time from work, rate of pay, or other damages related to the accident. Claimant alleges unsubstantiated damages to an item of unusual value as a result of the fall, such as expensive jewelry, camera, or personal electronic equipment (stereo, computer). If you do observe these red flags or other indicators of fraud, do not take action on your own to deny a claim or otherwise alert a perpetrator of your suspicions. You may inadvertently hinder the investigation. Instead report these red flags or other indicators of fraud to your insurance representative. In a recent instance involving a false claim filed against a hotel, the Claimant is being charged as a habitual offender for three prior convictions in Louisiana. The opinions expressed in this blog and those providing comments are theirs alone and do not reflect the opinions or views of HSCG or our Managing Members. HSCG is not responsible for the accuracy of any information supplied. The publishing or posting of any copyrighted materials on this site are used under the guidelines of “Fair Use” in accordance with USC Title 17 and 107. All content remains the copyright of the original holder and is used here for the purpose of education, comparison and criticism only. No infringement of copyright is intended. When available, full attribution is provided to the original author or information source. On behalf of The Hospitality Security Consulting Group (HSCG), welcome to our Blog. We created this site with the intent of sharing current and relevant life safety and security news specific to the hospitality industry. We will post news, Best Practices and important tips to assist you in protecting your guests and hotel operation. Please subscribe or bookmark this page as the content will updated frequently. Being informed is the first step to being prepared! Operating from Reno, NV, we are a licensed (NV Security License #1591) security consulting practice providing risk assessment and suggested corrective measures to mitigate a wide variety of threats to your guests, personnel, facilities and systems.